A resort where you can ski right up to your front door, Super Besse, located on the southern slope of the Sancy, caters for any skiers at an altitude of between 1300 and 1850m. Whether on an activity holiday or a break with your family, Super-Besse has something for everyone, catering for both fans of skiing and those of alternative ‘sliding sports’. 21 ski lifts in total: 1 cable car capable of carrying 20 people (rate: 3,000 people/hour), 5 chair lifts, 13 ski tows, 2 moving walkway. 1 snow games area L’enclos de Tibou: a safe, enclosed area with snow and foam obstacles. Free access. Organised events during the holidays. 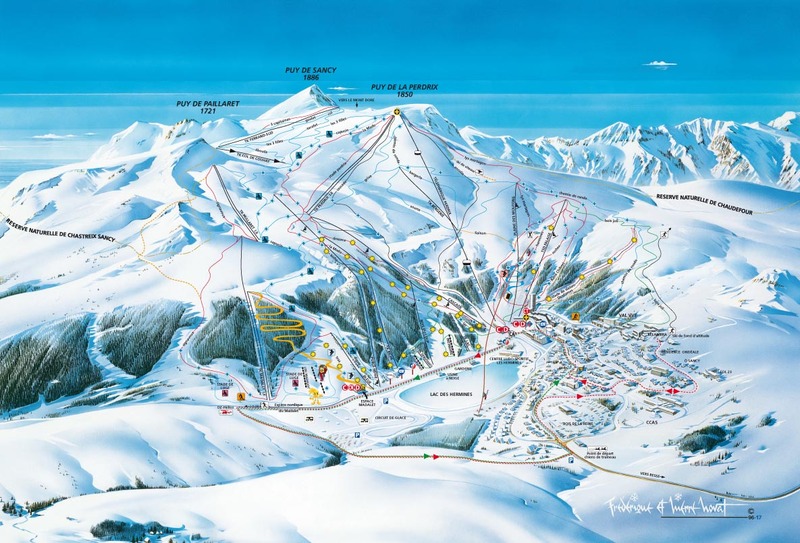 Super Besse’s ski resort is opened (it depends also of the snow level) from the ending of December to April. Every day ski patrollers are welcoming you from 9 a.m. to 5 p.m.
1 area for night-time skiing with 4 green slopes, 2 blue slopes, 5 red slopes, 2 black slopes. Night-time skiing from 5 p.m. to 8.45 p.m. every day during the school holidays and every Saturday and Wednesday at other times.